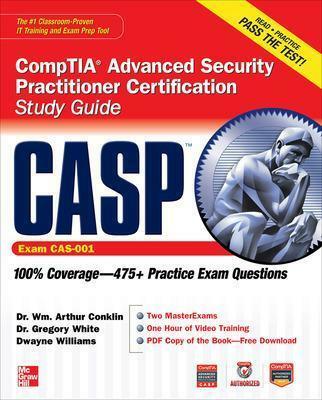 The Best Fully Integrated Study System Available for Exam CAS-001With hundreds of practice questions and lab exercises, CASP CompTIA Advanced Security Practitioner Certification Study Guide covers what you need to know-and shows you how to prepare-for this challenging exam. McGraw-Hill is a Gold-Level CompTIA Authorized Partner offering Authorized CompTIA Approved Quality Content. Wm. Arthur Conklin (Houston, TX), Security+, CISSP, is an Assistant Professor in the Information and Logistics Technology department at the University of Houston. In addition to his PhD, Mr. Conklin has a MBA from UTSA, and two graduate degrees in Electrical Engineering from the Naval Postgraduate School in Monterey, California. Dr. Conklins interests are information security, systems theory, and secure software design. Greg White (San Antonio, TX), Security+, CISSP, is an Associate Professor in the Department of Computer Science at the University of Texas at San Antonio. Dr. White is the Director of the Center for Infrastructure Assurance and Security at UTSA, and was the author of the first edition of the Security+ All-in-One Exam Guide from McGraw-Hill.